"Breaking fast" somehow sounds so much more epic than "Breakfast" But how ever you want to say it we have all heard how important it is to eat in the morning. Now there is rarely a time in the day I don't want to eat, but what I don't feel like doing when I start my day is cooking and cleaning pans. eggs sometimes make me feel a Little sick and toast, well there is nothing very healthful about that and not to terribly appealing to me. My usual breakfast is a very healthy protein smoothie that Steve make before he leaves at 6am for work. Soy protein powder, and big handful of raw spinach, a banana, strawberries and blue berries - we picked 40 pounds of blueberries locally last summer and I froze them for the rest of the year. I am hoping they last till June. This year I will pick at least 52lbs so that I can make sure we have a Pound a week. at 2.00 a pound, it is a very healthy choice. That is choice number one. Number two choice is Oats. I make a big batch of really good oatmeal, this is a version of instant oats that is wonderful and healthful. This is often my choice for lunch or a snack. 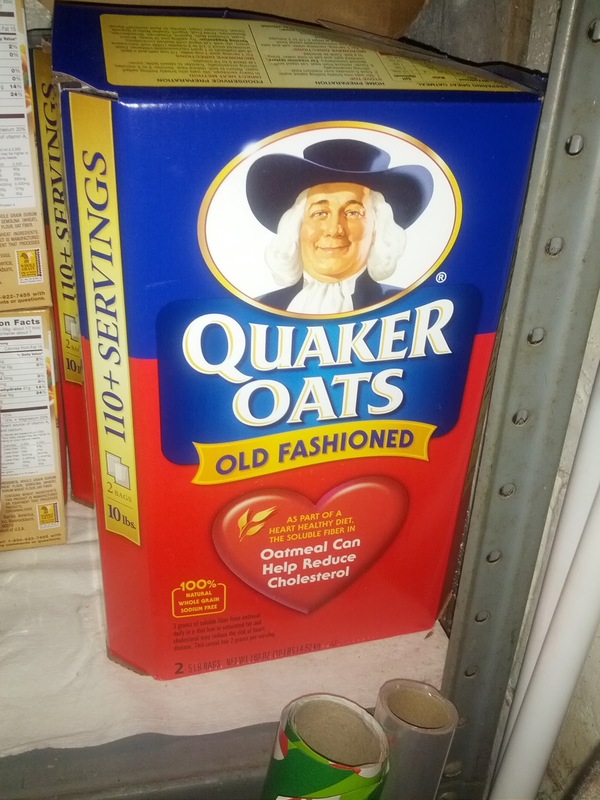 I start with Quaker oats, the big fat oats not quick cook. I purchase these at Costco and the box is about 9.00. Here is a box sitting on my pantry shelf, a picture is worth much more than my typing! It is a gaint box, with two packages inside. I start with one of the packages. 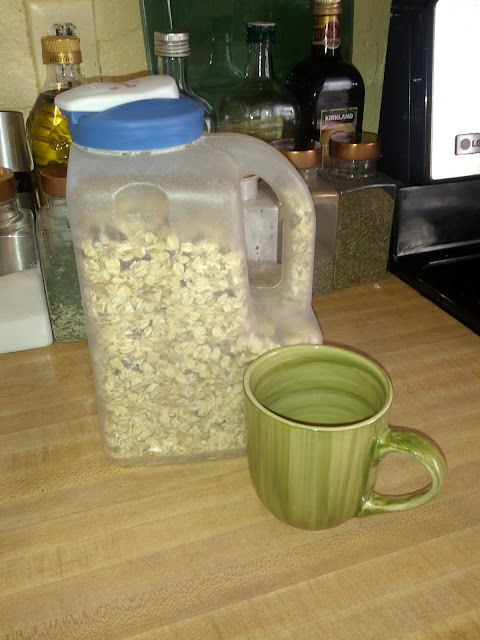 This is a picture from the Internet, I use the large container for our smoothies and the small one to make all may salad dressing, chop onions, nuts and dried fruit. I love this machine, it has been such a work pony in our kitchen, all for 45.00. We have had it for three years and it is running great. When I need a work horse I use my Cuisinart, that probably even mixes cement( not to be confused with some of my cooking). I do the Nuts first because the dust left in the chopper keeps the dates from sticking and globbing together. 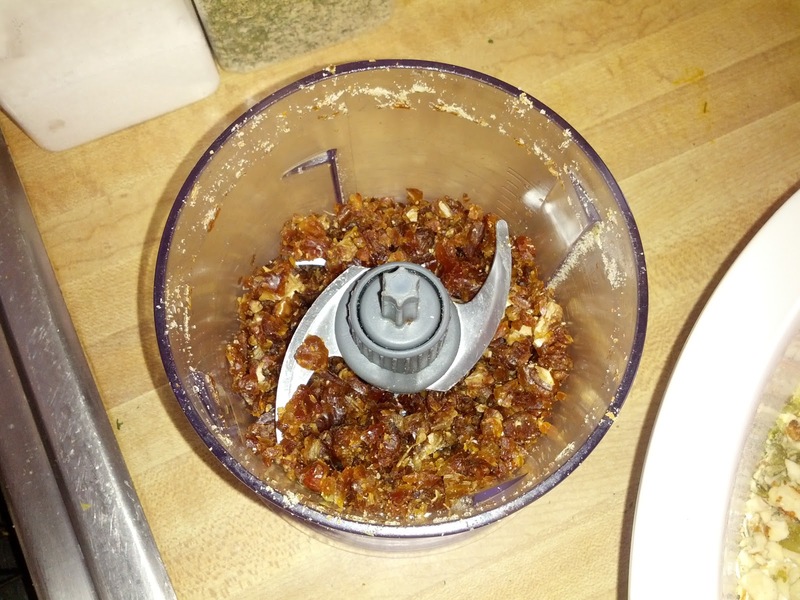 This does a wonderful job on the dates, it chops them into perfect size pieces. 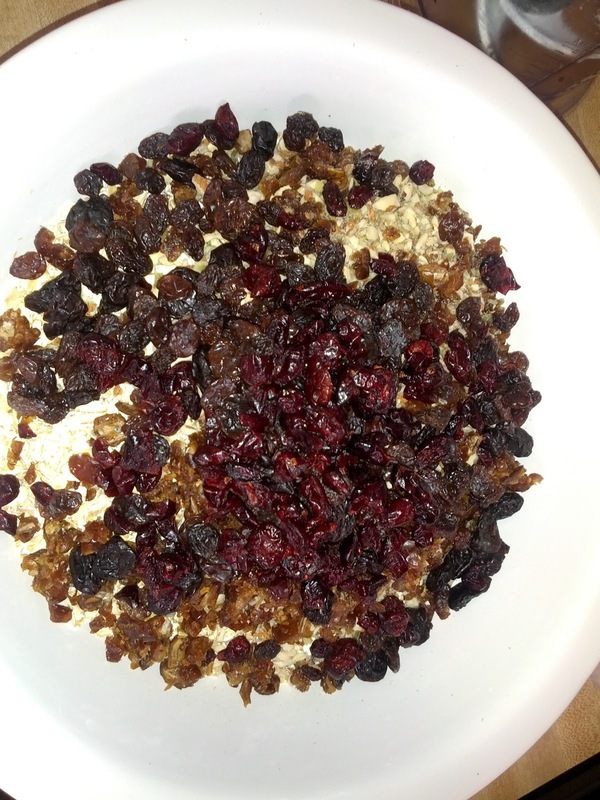 That goes into oats, then I add about 2/3 cup each of dried cherries, cranberries and raisins. I am careful where I do my purchasing and I am fortunate to have very nice places to make my selections. For my dried fruits,my walnuts and almonds and oats I go to Costco. If I can get organic with out taking a second mortgage on my house I will. For my seeds and beans and specialty flours I go to whole foods, and believe it or not, for premium oils and vinegars the best place around here is Ocean State Job Lot!! It pays to look around. 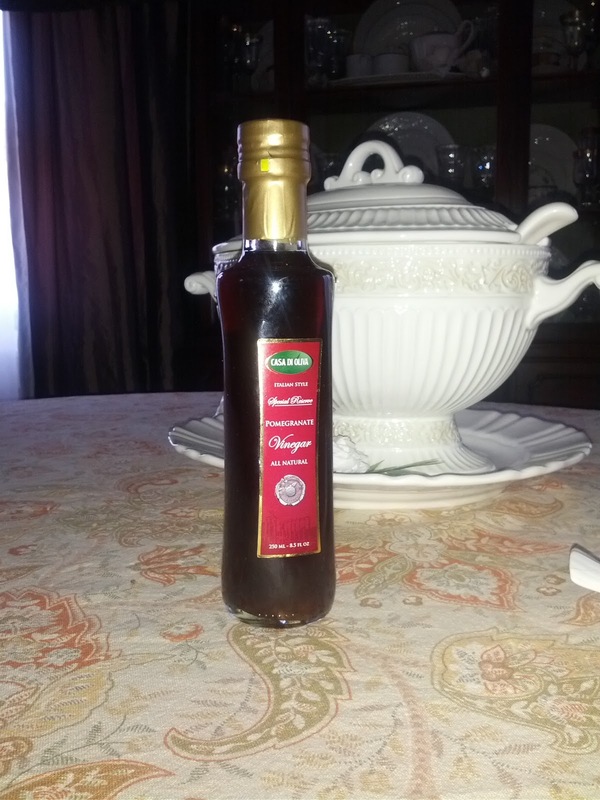 at whole foods, my pomegranate vinegar is $6.75 for a 8.5 oz bottle at OSJL it is $$1.25!! I will give you the recipe for my pomegranate vinaigrette in another post - you will eat more salad because of this dressing! Now you mix this all up and place it in a storage container. I placed the mug there to give you a size idea. 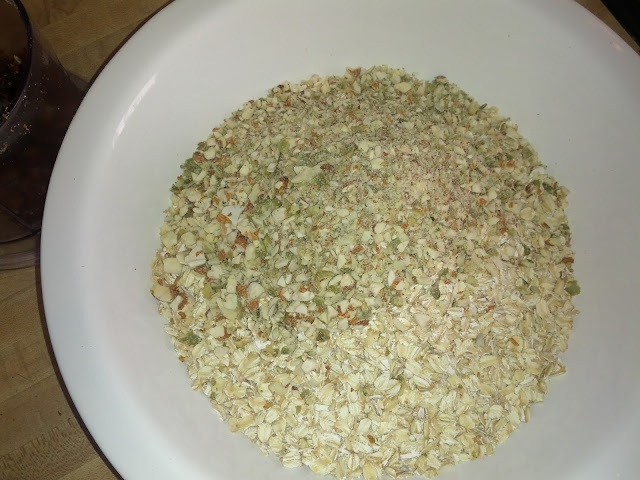 I store the mix in my cabinet and when I am ready for a hot bowl of oaty yum, I take a half a cup of mix and 1 cup water cook in my microwave for 90 second on power 8 ( you don't want this cooked on full power, trust me, exploded oatmeal is a real pain to try to clean. 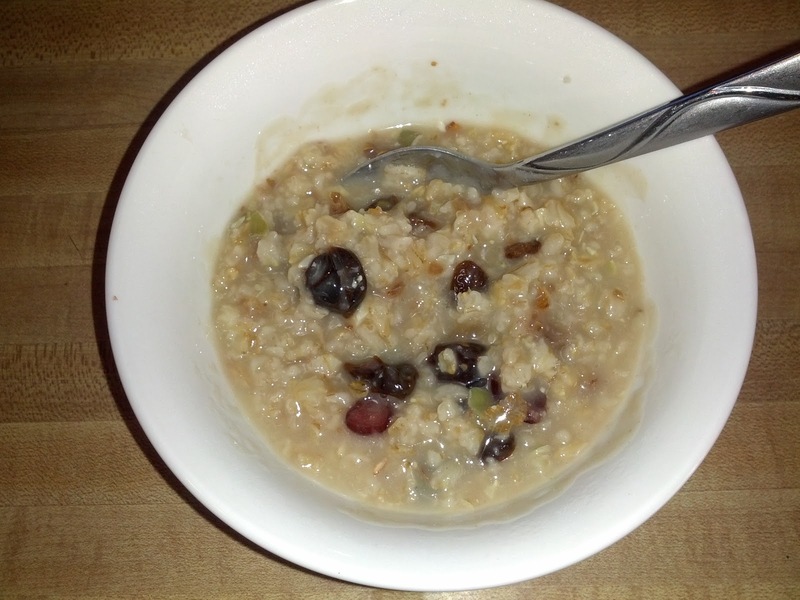 If your microwave isn't high powered then no worries, but mine is and I have blown up more than one bowl of oats! 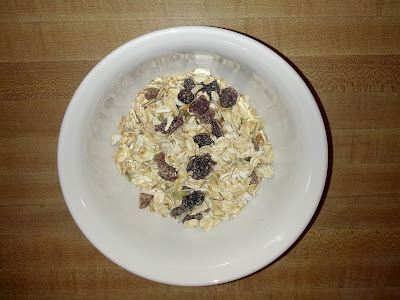 I always add a splash of milk, and this does not need sugar, the fruit, especially the dates makes this very sweet and the nuts give a very rich taste. So after tallying the cost of the ingredients, this breakfast of 100% nutrition come to about 35 cents. Whole foods are so much more satisfying, when you eat right you don't have cravings and chemical dervishes going on. But it does take practice and patience. Just because it is a whole food doesn't mean you are going to like it, but you have to keep trying new things. My favorite food magazine is "Eating Well" Is is one of the few publications I will pay for and feel like I have gotten my monies worth, a awesome blog is here: http://www.101cookbooks.com I have learned so much from both of these resources! Steve and I have been "practicing" whole food cooking and eating now for about 5 years, it has been a great adventure and I am thank full for the health benefits, even more so when Cancer was something we had to deal with last summer. I think what we eat is so important to the quality of life we live, and that having our table healthy is a part of stewardship. I love having a fresh bread, to break both in the natural and spiritual to share with a friend, sometimes it helps people hear other good things we have to tell them. I was evangelized by a plate of chocolate chip cookies and a house full of the Love of Jesus! But that is another topic!! Have a wonderful weekend, be kind to your self, rest and eat right!